If your supporters fancy themselves snack lovers, just wait until they get a taste of these! 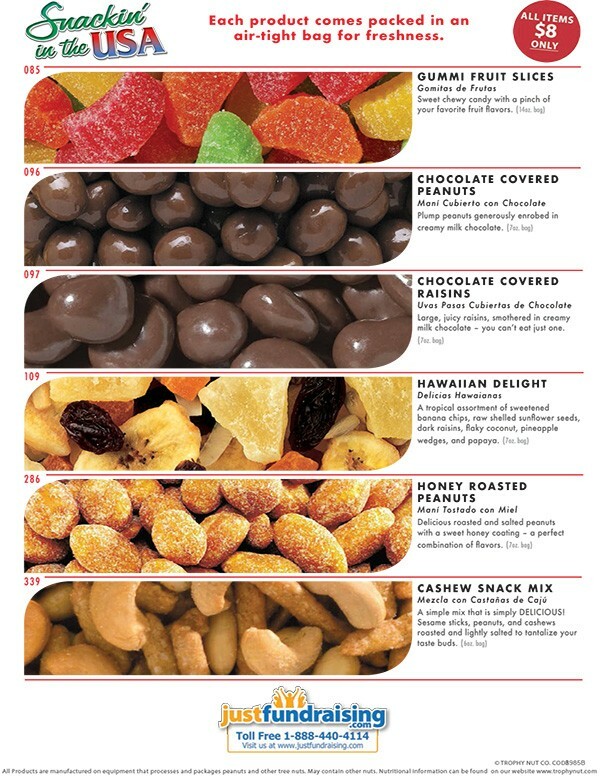 Your supporters can choose from 20 mouth watering treats all made from premium quality nuts and candies - now that's what we call delectable munching! At only $8 each, many supporters will buy several at a time. Your group keeps 50% of everything you raise. FREE to Start: The Snackin’ in the USA fundraising program costs absolutely nothing to get started. Simply let us know how many fundraising participants you have and we’ll send 1 order-taker for each of them, at no charge. 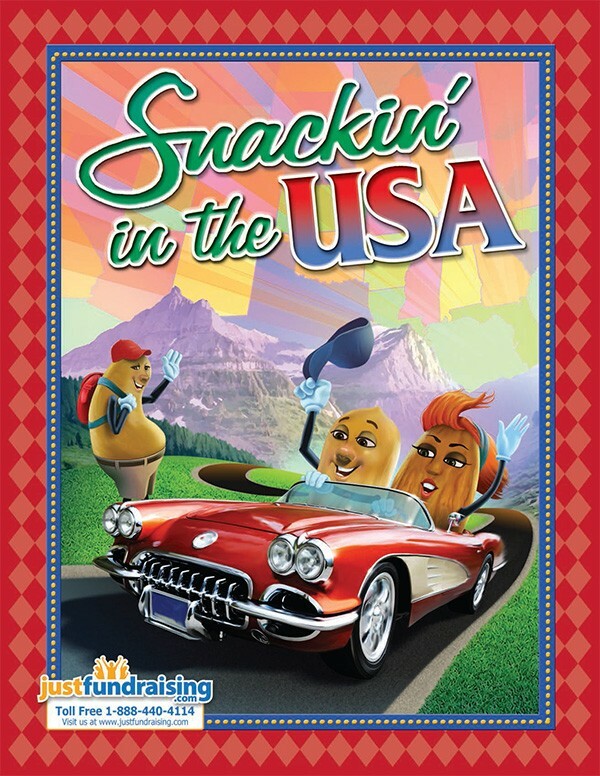 How Does the Snackin in the USA Fundraiser Work? 1. 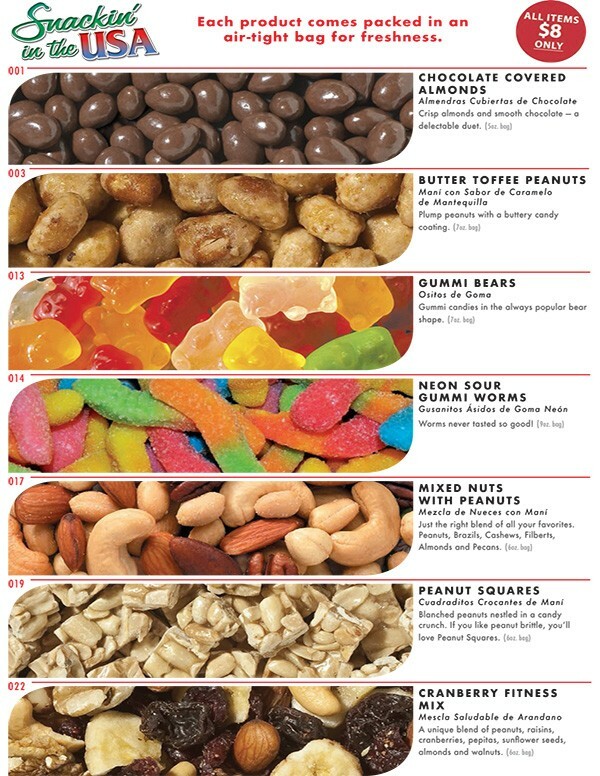 Order 1 Snackin in the USA order-taker PER fundraising participant – they’re FREE of charge! This was the first time our band tried doing any type of fundraiser so we decided to try Snackin' In The USA. We are absolutely thrilled with the results! We only had 20 sellers but managed to raise over $1000 profit! The money will help pay for our kids travel expenses so they can perform at six flags. My family gave this fundraiser a shot since we needed to raise money for our family reunion. We didn't know what to expect, but we were very pleasantly surprised. We raised over $600 profit which will help pay for expenses and accommodations for family members living out of state. This fundraiser was excellent for our school, we raised money for general expenses. The packet had everything we needed to promote our fundraiser and get the word out. We were very pleased with our experience. Very positive comments about the products and the company. Our football team just completed a successful fundraiser with Snackin' In The USA - Nuts About Sports. We raised $306 profit. We sold $1,040 worth of snacks between just 7 of us. It was a great fundraiser for our daycare. Thanks so much! Our chorus kids are going to Disney in march and they raised over $3,000 for travel expenses. Our Dance team was raising money for new uniforms, we sold Snackin in the USA it was great! We raised about $400 which is what we needed for our uniforms! My son did this fundraiser with his baseball team last year and he was the best-seller of the group, he sold over $1,500 worth! He decided to use the same fundraiser again this year for his safety patrol at school. He sold over $1,600 worth this time which will help pay for his trip to Washington DC. Our 30 member choir is raising money to go to Disney and sold $4,520 worth of snacks in just a few weeks. Your company made everything very easy. Our drill team purchased new uniforms with the money we raised from Snacking In The USA! Our fundraiser went much better than expected. Only half of our group ended up participating, but we ended up raising ever more than we aimed for. One person sold $500 on their own! The profit will go towards new gowns, caps and to put on a dance. Our Daycare was raising money for new outdoor equipment. This was our first time using this type of fundraiser, and although we only had 8 sellers participate we still ended up raises over $500 in profit. We used the parent letter from the fundraising guide as a template to send letters home with our group members. We also gave the best seller a $25 gift certificate. We're a college group that was raising money for a mission trip. We only had 9 sellers participate but we ended up raising almost $800 in profit! I gave the group members their forms and they just ran with it. They did different things to promote the fundraiser such as posting it on their facebook pages. 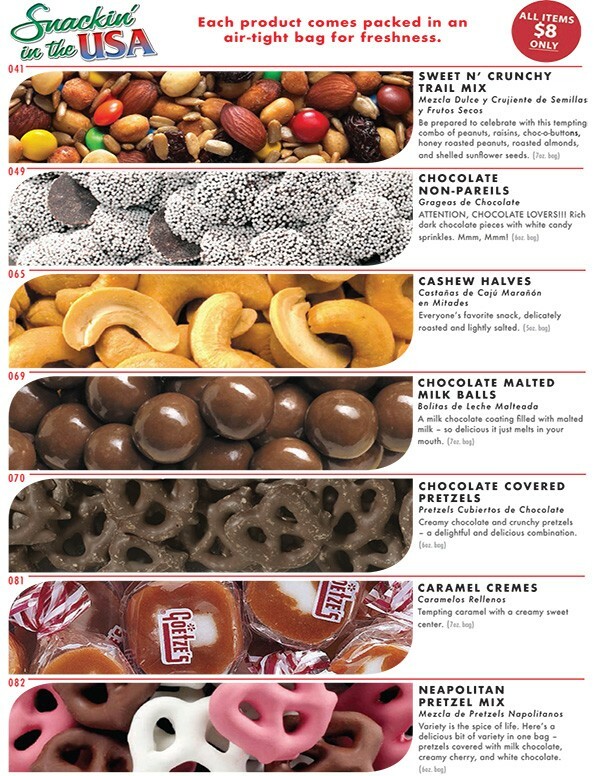 My volleyball team sold the nuts/snacks to help defray the cost of their sports fees. Most of the players participated to the point where their sports fee was $0. Thanks JustFundraising for a quick easy profitable product. This was our first time ordering with your company and we have ordered again because of the great first experience. Our dance studio raised over $3,000 for recital costumes! We had about 40 sellers participate in the fundraiser. To spread the word we sent out e-mails and talked about it during class to the kids and parents. We've been doing business with JustFundraising for 6 years in a row. Our softball club of only 4 teams, again raised over $5700 profit with just 48 players. Our funds are going towards helmets, bat bags and other supplies we'll need for participation in this year's All-Star tournament. We only had a group of 6 sellers but we raised over $800 in profit. All of the money raised will go towards an educational fund that helps kids go to college. We had a group of 16 sellers and we were raising money for a new playground play set. We offered a prize for any person that sold 15 or more items which was a big help since it set a goal for the sellers. Everything was very easy to sell, we ended up making over $700 in profit! We used Just Fundraising to help our Cheerleading Group raise money for competitions and uniforms! We sold over $2,000 worth of snacks! Our fundraiser went very well, we raised over $1000 with a group of 50 sellers. This is our first time doing this type of fundraiser and we were very happy with the results. We are a school for autistic children and we were raising money for a new playground. Price was low and reasonable so many people bought several snack items. Having everything sell at one price ($7) made it really simple. We had a group of 25 sellers raise over $1,200 for our competition in Nashville. This fundraiser is great, the profit can’t be beat! We are Team Edwin! We are raising funds for the Alzheimer's Association of WNY. We are very happy with JustFundraing and the products they offer. The quality, the prices and especially the customer service. We will definitely be doing another fundraiser with them. Where to start... Snackin’ in The USA is what I did...yummy for the tummy is all I can say. It was a success. My softball team has entered many tournaments and the remaining funds are for new uniforms. Thanks so much!!! Will be doing again!!! We used our fundraising to assist with a repair project. It went just great!. We are putting our funds towards an overnight trip to a handicapped accessible indoor water park in Vermont. As President of the Roberto Alvarado Foundation, I was astonished on how successful the fundraiser turned out to be! My group could've done more, but the profits that we received were higher than I expected! This was my first time conducting a fundraiser, but with JustFundraising's Customer Service, I was guided throughout the way. My Foundation will continue to raise money through JustFundraising in order to bring awareness on Parkinson's Disease by starting local events. We made a great profit and everyone enjoyed the products. The funds raised are towards our building fund for my church as we are in the process of building as we have outgrown other space. We raised over $500 for our church youth department. We do this fundraiser every year and it always goes well. We even have customers asking us when we will do it again. Our organization just purchased a new building and we raised over $750 to help pay for renovations. We had a group of only 7 sellers and we raised over $650 in profit for our basketball team. Everything about this fundraiser was very easy. From getting started to submitting the final order, everything is very user friendly. Thank you JustFundraising, we are using the profit from our fundraiser to pay for a spring training tournament in Arizona. Very please with the quick turn around of my order and how quickly my Smart Snack products came to my house. Customer service GREAT! Getting ready for the next fundraiser. Fast service and totally satisfied. Best fundraising event we had so far. The customer service reps were very helpful and polite, they helped me choose this fundraiser for my team and it turned out great. We ended up raising almost $1000 which was well above our goal, the flavors all sound so tempting so getting people to buy was not hard! JustFundraising is a simple way to hold a group fundraising activity. All instructions were easy to follow, the customer representatives were easy to work with, the kids were enthusiastic about selling the product, product arrived before the expected arrival date. Overall it was a great experience and if the opportunity for a fundraiser comes up again, I will definitely consider using JustFundraising! The kids were really excited about this fundraiser and it showed because they actually got out there and sold the product. Products appeared to be high quality. Overall we were very happy with this fundraiser and will consider using JustFundraising in the future. Raising money to attend 2 world series this year. We have used JustFundraising a couple of times for our baseball team. The prices were right and the product was good. We raised enough money to help our team with purchasing uniforms and paying for tournaments. We used our profits for to purchase new helmets and bat bags for our travel softball teams. My Top Teen Group is using the money to help take care of expenses to attend a leadership development conference. We will do this fundraiser again but do it for a longer period of time in order to get more orders. Customers were extremely satisfied with the quality ! She earned $510 profit all by her 12 year old self. With the money she has earned from odd jobs and the profit from her fundraiser, Sophia will be able to attend Event Camp next summer. This will be the third year she has raised all the money by herself to attend camp. Our team participated in the snacks catalog to help fundraiser for our competition fees to compete around southern california and as well to Las Vegas, Nevada. We as well fundraised to purchase team gears for our parent supporters. This fundraiser was a big success for us and would recommend it to others!